There was always something about those guys from Africa. They were just different from the black people here. At my alma mater, Morehouse College, it was no big deal to have classmates of royal African lineage. Even the ones who were not royals had decidedly regal bearings. To see them was to see what it looked like to know — to internalize — just how exceptional you were, even as your own existence was shrouded in the ambient legacy of slavery. Those African students were just part of my unique, four-year experience of being immersed in the virtually all-black world of the Atlanta University Center, the nation’s largest grouping of historically black colleges and universities. My experience in that world made watching Marvel’s remarkable “Black Panther” feel uncannily familiar. I had already experienced a westernized Wakanda. The parallels to Morehouse and black life on the whole overrode the exceptions. The AUC Wakanda wasn’t perfect, but it was close. The film, like the AUC, was an outsized expression of black excellence — materially, morally, and educationally. I lived among, went to class with, and befriended the smartest, most capable people on the planet. Purposeful people whose overarching aim was to equip themselves to be the very best for themselves and their communities, and trained by elders — instructors and administrators — with invaluable wisdom about how the world works away from the AUC. “Black Panther” reminded me of being in the AUC again. It was like going to a second homecoming — and it was full of valuable takeaways. Wakanda women are not eye candy. They don’t play ancillary roles. Angela Bassett’s character, Ramonda, personifies the mass of women who are the brains and brawn of Wakanda. Violence is discouraged, but when forced to fight, T’Challa (Chadwick Boseman) is protected by warrior women — the Dora Milaje — who handle the business. Their leader, Okoye (Danai Gurira) is riveting. Black people abound. Not “black” in the general sense, which covers a handful of hues. I mean truly dark-skinned people dominate the screen. The only light-skinned, long-haired sister in the movie was an afterthought. On the women. 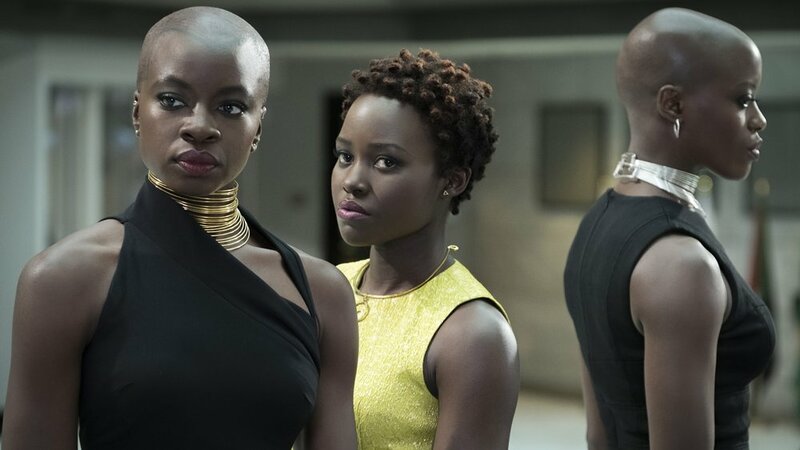 The Dora Milaje consider hair an encumbrance. They look amazing without it, and I defy anyone to say their lack of killer coifs diminishes them in any way. That is evident in the movie-stealing work of T’Challa’s sister, Shuri (Letitia Wright). She’s not only a princess, she heads up development of the advanced technology that drives Wakanda, and equips the Black Panther for his work. If ever there was an advertisement for women in STEM fields, this is it. Disney evidently thought so. It is donating $1 million to fund education programs science, technology, engineering, and math. His rage is warranted and his cause noble. Left fatherless and denied his royal heritage, he overcomes the hood of Oakland to go to MIT, become a killing machine, and get payback on the folks in Wakanda. His aim is to use the resources there to help black folks globally to defeat their enemies. You feel for him as African-Americans because, like him, we are also a homeless group — those unable to truly connect with our people there and are not truly accepted here. That simmering consciousness makes you root for Killmonger’s success. Even well-meaning black people of means have blind spots to the suffering of their people. You want to give the folks in Wakanda a pass for cloaking their highly advanced society from the world. Remember: That West Africa-to-Charleston regatta was quite an excursion for my people. And the folks in Wakanda had already seen what happens when white folks discovered their resources and stripped the continent of them for their own gain. The Wakandans can argue they hid their world to keep it from pillage, but there is no denying that wealthy civilization had the power to help black people around the world, but sat on it. In “Black Panther,” you totally get that struggle between the haves and have-nots within the same race. When Shuri lobs that designation at Everett K. Ross (Martin Freeman), a CIA agent, it is an obvious put-down, but more matter of fact than mean-spirited. But this movie will make “colonizer” part of the lexicon. It already comes to mind reflexively in instances of cultural misappropriation and social awkwardness. For instance, at a party last weekend, I was the only person of color in the room. A guy nudged me and said, “Here’s something that will interest you,” then launched into a story about seeing this lone, large black guy on bass (Randy Jackson) jamming with Journey. Because he so wildly misjudged my interest in his discovering the former “American Idol” judge actually had a career in music, all I could do was nod in the appropriate spots. “Black Panther” is no Tarzan movie. If you’re looking for bwana, you won’t find him here. The two principal white characters — Freeman’s CIA agent and bad guy Ulysses Klaue (played by the remarkable Andy Serkis) — were there to move the story along, not to save the day. There has never been a movie like “Black Panther.” And the response at the box office shows it. Going into its third week of release, it is sprinting toward $1 billion in ticket sales worldwide. That means folks with dates and families are seeing it more than once. And what are they seeing? A world of black people that is free of images of pimps, prostitutes, drug addicts, slaves, and irrationally angry, broken characters. The Wakandans have purpose. They are going somewhere. Just like my fellow students in the AUC.